Above, the newly renovated Baker Library on the Harvard Business School campus in Allston. The search for a new dean has narrowed to seven candidates, with Srikant M. Datar as the frontrunner, professors say. Dickinson Professor of Accounting Srikant M. Datar has emerged as the leading candidate to succeed Kim B. Clark ’74 as the next dean of the Harvard Business School (HBS), according to professors at HBS and other top business schools. Clark’s abrupt departure this summer to lead Brigham Young University-Idaho left the school at a crossroads, as faculty debate the school’s guiding vision for the future. In interviews with The Crimson, HBS professors said Datar was a frontrunner for the deanship, along with six other frequently mentioned candidates, four of whom are currently working at HBS. University President Lawrence H. Summers will select the new HBS dean in consultation with a 15-member faculty advisory committee. Of the six deans Summers has named to lead Harvard’s faculties during his four-year tenure, five have come from within Harvard. The central issues likely to face the next dean of HBS include defining the fundamental meaning of a graduate business education, resolving the conflict between the school’s dual purpose as a center for academic research and as a professional school, and addressing the school’s growing international role. And because the HBS deanship holds such a respected place in business academia, the new dean’s leadership will extend far beyond the school’s campus. “The next dean needs to be someone who is willing to provide leadership to this school as well as to the business education community,” says Kirstein Professor of Human Relations Jay W. Lorsch. Lorsch notes that the new dean will also have to determine how HBS—the only business school that relies entirely on the case study method—can best stay in tune with the rapidly evolving business world. MBA Class of 1954 Professor of Management Joseph B. Lassier III says that the HBS faculty do not seem to be near a consensus on the school’s direction, but he observes that a dialogue has grown among the faculty. “There has been a huge amount of discussion involving the many different views about what the school should be like in the future,” he says. Datar, who was born in India and has worked with a number of major multinational corporations, seems well positioned to promote the school’s international focus. With both real-world business experience and a substantial body of research to his name, furthermore, he would bring knowledge of both realms to the job. Datar was also mentioned on short-lists compiled by Business Week and by the Financial Times. 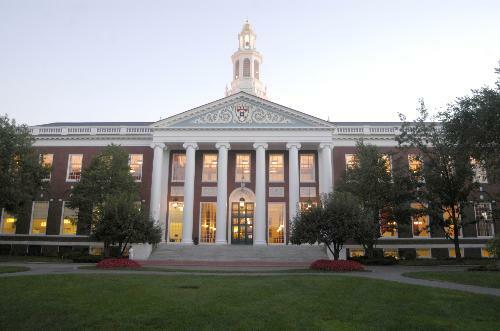 The Crimson contacted several dozen full professors at HBS about the school’s next dean. Many professors did not return calls for comment or declined to discuss the issue on the record, saying they had been told not to speak to the media about the dean search. But those who did comment on the record—most of whom did so anonymously—generally agreed on a list of a half dozen other candidates in addition to Datar. Besides Datar, the list includes Rebecca Henderson, a professor at MIT’s Sloan School of Management who received a doctorate in business economics from Harvard in 1988; Nitin Nohria, Chapman professor of business administration at HBS; John Quelch, Filene professor of business administration at HBS and former dean of the London Business School; Debora L. Spar, Spangler professor of business administration and senior associate dean for faculty recruiting at HBS; Peter Tufano ’79, Coleman professor of financial management and director of faculty development at HBS; and Laura D. Tyson, dean of the London Business School and former dean of Berkeley’s Haas School of Business. All six were mentioned by Business Week or the Financial Times. Tyson served as the national economic adviser in the Clinton administration in the mid-1990s, working alongside Summers, who was in the Treasury Department at the time. Most of those professors who discussed specific names would not elaborate on individual candidates’ chances. All eight deans in the 97-year history of HBS have either held degrees from Harvard or held professorships at the University, according to HBS spokesman James E. Aisner ’68. While the school’s first and second deans had Harvard degrees in economics and in law, respectively, every dean appointed since 1919 has been either a former student or faculty member at HBS. And Summers has preferred to appoint internal candidates to lead Harvard’s faculties. Any HBS dean would likely have to be familiar with the school’s unique teaching method. HBS’s faculty teaches solely through the case-study method, in which students are confronted with real-life business dilemmas and must decide how they would act. Roth Professor of Retailing Rajiv Lal says that speculation over contenders for the deanship may be “misleading,” since Summers alone has the final say in choosing the school’s next dean. “The right thing for us to do is to ask what’s right for the school and for the University,” Lal adds. Summers could not be reached for comment on the dean search, and none of the professors contacted by The Crimson would say when Summers might announce the appointment. Clark’s successor will have big shoes to fill. Appointed dean of HBS in 1995, Clark spearheaded initiatives advancing entrepreneurship, internationalism, business ethics, and the use of technology as an integrated teaching tool. During his nearly decade-long tenure, the HBS endowment rose from $550 million to $1.8 billion, the faculty grew by 20 percent, and 350,000 square feet of new facilities were added to the campus, according to a press release. In addition, the school set up six research centers around the world, and the student body became markedly more diverse during that time. A required course in leadership and corporate accountability was also added. But Clark’s deanship also saw controversy last spring when dozens of prospective students, tipped off by an online hacker, tried to gain unauthorized access to a website detailing their admissions status at HBS as well as at five other top business schools. Less than a week after the breaches became public, HBS decided it would categorically reject all 119 applicants who had attempted to check their admissions status—a move that some critics called unduly harsh. “This behavior is unethical at best—a serious breach of trust that can not be countered by rationalization,” Clark wrote in a statement, emphasizing the school’s renewed focus on ethics in business leadership. Robinson Professor of Business Administration Jay O. Light, who took the reins as acting dean of HBS after Clark’s departure at the end of July, is slated to lead the school until Summers taps a new leader.